Raymond C. Heisler, 85, of Erie, passed away at Elmwood Gardens on Wednesday August 29, 2018 following a brief illness. He was born in Erie on January 18, 1933 a son of the late Charles L. and Jessimae Loftus Heisler. Raymond graduated from Academy High School in 1951 where he played football and ran track and then went on to attend Erie Business College for two years. He served in the United States Coast Guard during the Korean War. He worked for Erie Farm Products in sales for 10 years and for Buckeye Biscuit of Cleveland as a salesman for 27 years before retiring in 1996. He was coach and commissioner for the Carl Mango League of Boys Baseball and also served as a line coach for the Our Lady of Peace football team. He was an assistant scoutmaster for the Boy Scouts at St. Michael's Catholic Church and was a judge at Decca for Erie Co. Vo-Tech for 14 years. 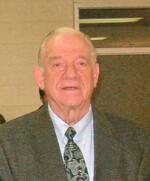 He was a member of St. Paul's Catholic Church and a life member of the East Erie Turners. He enjoyed all sports, including hunting and fishing, and he enjoyed following the stock market. In addition to his parents he was preceded in death by his wife, Victoria "Vicki" Franceschello Heisler and one brother, Robert L. Heisler. Survivors include his daughter, Lori A. Heisler of Erie; one son, Raymond A. Heisler of Erie; four grandchildren, Matthew, Nicole, Nicholas, and Kaylyn; one great granddaughter, Aubree; one sister, Charlene A. Levosky of Erie; and many nieces and nephews. Friends are invited to a Funeral Mass at St. Paul's Catholic Church on Saturday at 10:00 a.m.. Burial will follow in Mary Queen of Peace Cemetery. Memorial contributions can be made to the Carmelite Monastery, 510 East Gore Rd., Erie, 16504. To send flowers to the family of Raymond C. Heisler, please visit our Heartfelt Sympathies Store.